Unparalleled in grandeur on Oahus emerald Windward side, Kai Moena, "House of the Resting Sea, " is a stunning oceanfront estate that reflects a skillful merging of modern architecture and luxury design. Inspired by Hawaiis culture and climate, this 60,000 sq. ft. property with over 250 linear feet of pristine white sand was owned by the storied Rothschild family. 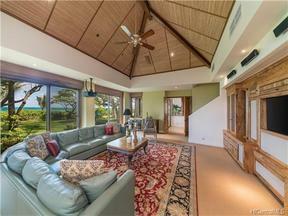 Kai Moena is comprised of two main residences including ten bedrooms, eight full bathrooms and three half baths. Rich tropical hardwood accents and textured finishes to the high vaulted ceilings give a warm opulence and living spaces flow seamlessly between indoors and outdoors for maximum ease. Luxury amenities include two fully appointed kitchens with granite countertops, a tennis court, dry sauna, fitness and media rooms, and a lagoon pool.